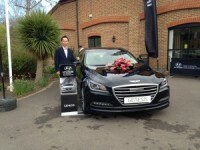 Hyundai UK sponsored a £45,000 Hyundai Genesis for the Korean Chamber of Commerce Society golf day and ended up awarding a lucky player one of their own cars! Although there were prizes on all of the Par 3′s, lucky winner Mr Rai Park waited until the 143-yard 17th to land his hole-in-one and win the car. The 18 handicapper was playing in just the second group out on the golf day at the Silvermere Golf Club in Surrey. The rest of the field didn’t lose out on the chance of winning a car of their own though with Worldwide Hole n One’s multiple winner hole-in-one insurance coverage ensuring that the prize remained up for grabs for the remainder of the tournament. It was just Mr Park who drove off a winner on this day though, his fantastic Ace the sole hole in one at the event in April. Maybe your golfers will strike lucky this year..? Complete an online proposal form to receive a quick hole-in-one quote for your event.